I've posted this before, but this is possibly the best recipe I have ever tried for banana bread. The yogurt makes all the difference and it is a lovely moist banana bread with a great flavor, definitely a favorite around here. I made one loaf for 3 of us (Faith was at camp). I have 2 pieces left. It is absolutely wonderful. As well, it's versatile! 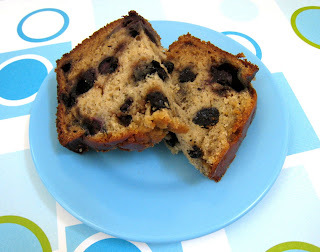 I threw in a few handfuls of fresh blueberries into the dough for extra flavor and fruit. I've made it before with cherries and I think pineapple would be quite nice, maybe next time. Add banana, yogurt, vanilla, blend well. My note: After blending in the dry ingredients, I added my blueberries so they wouldn't get mashed in the blending process. We need another loaf of this, one was not enough, but I'm out of bananas. sounds delish! I'm definitely going to try it. :) thanks! I'm going to try this one the next time I have some "ugh" bananas. I made the zucchini cookies - they are to die for. I think I ate half the batch in 2 days just myself! Love!!!! We tried this today and absolutely LOVED it!! Thank you so much for sharing, this will definitely be the recipe I use from now on! !